The Oakland Unified School District (OUSD) and the Oakland Education Association (OEA) agree there should be a raise for credentialed staff. According to the new contract, if OUSD receives more ongoing state funding for the 2016-17 school year than it received for the current school year, teachers (and other unions) will receive a portion of that increase. It is just how much and when. 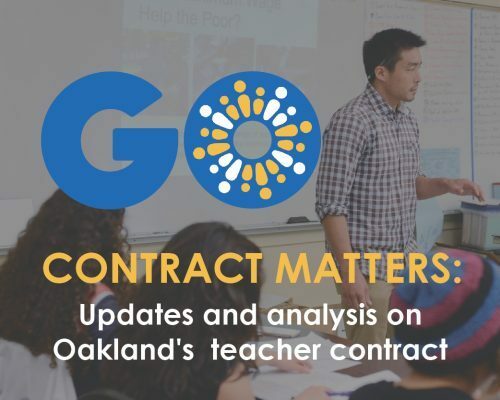 Check out pages 128-131 of the contract between OUSD and OEA for all of the details. The contract calls for OUSD to use funding projections to determine if there will be an overall funding increase from last year and then calculate a projected raise. Then, OUSD gives teachers 90% of the projected raise (retroactive to July 1st). The other 10% is held back until the actual funding numbers are finalized. Before Dec. 15th, the projected raise is adjusted based on actual funding levels. This year, this is an issue because while the state’s per pupil funding level increased, the total number of students enrolled in OUSD decreased. As per the report that Superintendent Wilson submitted to the school board on September 28, school enrollment is 872 lower than originally projected for 2016-17 and 413 lower than 2015-16’s 20 day count last year. Thus, there is less overall funding than the initial projections. Actual funding is the same as the projection – Teachers receive the additional 10% of the projected raise. Actual funding is less than than the projection – Teachers receive less than the additional 10% projected raise. 10% held back until adjusted for actual funding. Is OUSD required to give the raise based on projections and then make adjustments or could it wait and give the raise based actual funding levels? Is that what happened here? If OUSD’s numbers are based on actual numbers, does that mean that teachers are likely to receive the entire 3.41% raise that OUSD communicated? If OUSD gives 90% of a projected raise to teachers, are we locked into that raise even if actual funding levels would lead to a smaller raise? If so, what are the implications for the budget and how do we prioritize how to make the cuts mid-year? Are there other implications basing raises on projections? In an email, the OEA indicated it would file an “Expedited Grievance” to help resolve the disagreement. That process will play out in the coming weeks. In the meantime, the OEA members should receive the projected raise retroactive to July pending the outcome of the process.